Abstract patterns on the surface of Expeditions Pass Reservoir near Chewton in Central Victoria, Australia. When you're out and about sometimes the weather's not ideal for making photos. As a consequence your photos are less than pleasing and your enthusiasm for making photos may decline. Sometimes it pays to just stick it out a little longer and, if you're lucky, the goddess of photography will shine her light your way. As a case in point I was in Central Victoria in the old gold mining town of Chewton (formerly known as Forest Creek) on assignment. An otherwise dreary afternoon was punctuated with a splash of light breaking through the brooding clouds and onto the water below. 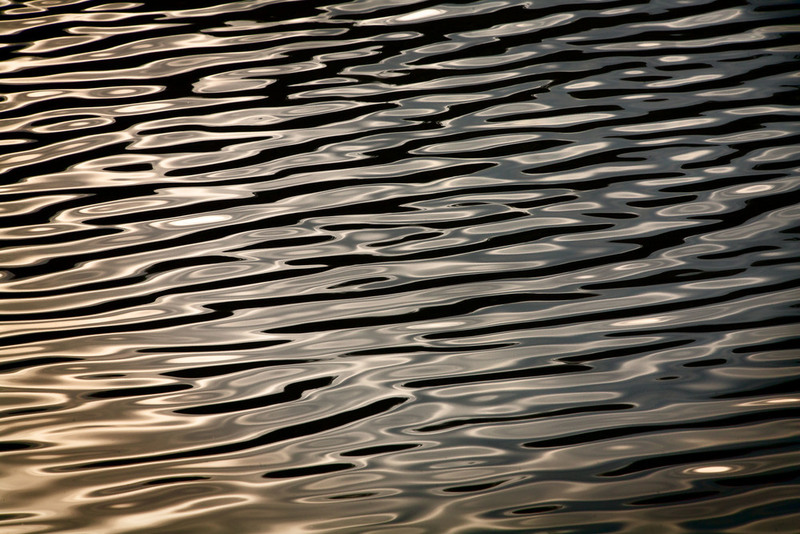 It was a simple matter of changing lenses to concentrate attention on the lovely play of light on the water's surface. I needed a reasonably fast shutter speed to freeze the patterns of light and dark swirls created by the breeze. All that was left was timing the release of the shutter so that it corresponded with the fantastic swirling patterns unfolding in front of me. I think it’s the repetition of those patterns, with variations on the theme, that make the image so mesmerizing. I hope you like it. A group of tourists taking a small boat tour on the canal in Bruges, Belgium. It's interesting how staying ready can help ensure that you come home with a higher percentage of keepers. When I'm out and about photographing I often have the camera in hand and am continually adjusting my camera’s settings, according to changes in the light and what depth of field I think would be appropriate for particular kinds of images. Should the need to make a photo quickly arise I’m ready and can respond without too much messing around. It's just a matter of getting organized, staying ready and attuned to what's going on around you. That’s how I was able to quite easily make this photo of a group of tourists taking a small boat tour on the canal in Bruges, Belgium. I was in another boat, because I wanted to show the city from the waterline, and was ready to make an image that spoke to the experience that many modern day tourists would have when visiting this beautiful medieval city. I chose a black and white rendering to further emphasize the nostalgic feel of this most beautiful place. I’m really happy with the story this photo tells. There are many ways to photograph water. The obvious recommendations would be to freeze action or, as you see in the photo directly above, to explore creative blur. However, I wanted to take this opportunity to explore a different approach to the topic. I think it’s worthwhile thinking about water as a canvas for abstraction, as I did in the photo of patterns forming on the surface of a reservoir in Central Victoria and again in the photo of the waterfall in rural Iceland. Alternatively, water can be used as an even more subtle element that helps tell a story, as I did with the photo of tourists exploring the canals of the once mighty trading city of Bruges. Do you like photographing water? You might want to take a look at some of your best photos that feature water and ask yourself are these simply documentary pictures of rivers, lakes and oceans. It might be that the very best of them are more than photos of water. Perhaps they’re jumping off points for exploration of the known and, on occasions, of the unknown.